This one is super easy. I was going to make something totally different for a potluck I was going to on the weekend, but due to a stovetop malfunction (long story) I had to change my plans and I was scrambling on a Sunday morning to find a recipe I could make with the grocery store closed using only what I had on hand. Luckily I had some pineapple, and this turned out pretty good. It’s very light and airy. I found this recipe on the BigOven.com iPad app. In a small bowl, combine brown sugar with melted margarine until completely incorporated. Spread into the bottom of a 9″ cake pan. 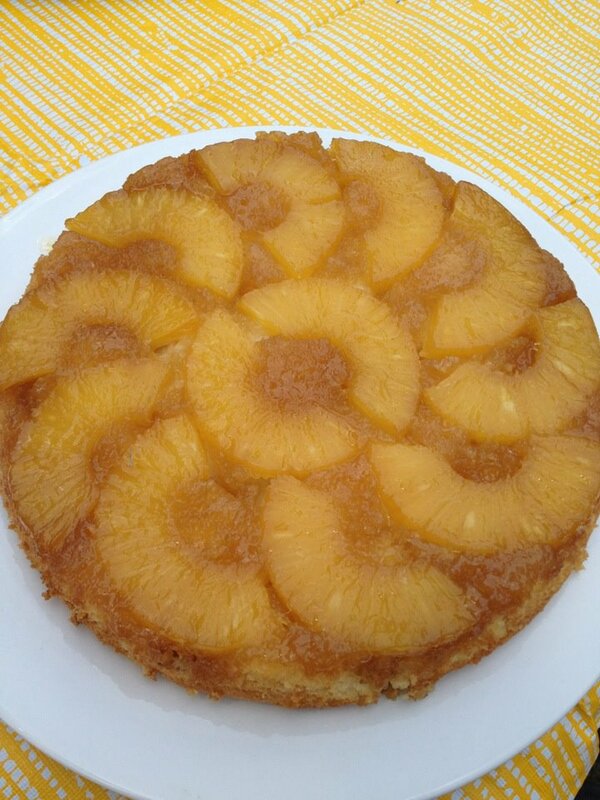 Arrange pineapple pieces and cherries in a decorative design in the brown sugar. Set aside. In another small bowl, whip the egg yolks with a mixer until light yellow and thickened. Gradually add in the sugar and beat well. Add flour, baking powder, salt and juice. Mix completely together. In another bowl, beat egg whites until stiff peaks form. Fold gently into batter. Pour batter and smooth over pineapples in pan. Bake 30-35 minutes. Top will be brown, tester inserted should come out clean. Let it cool in the pan for a couple of minutes, then invert onto a serving plate. This would be awesome with a scoop of ice cream, or some whipped cream, or even better, some rum enhanced whipped cream. Yum!